Merchants of Edinburgh Golf Club on Easter Craiglockhart Hill. Three golf holes in Edinburgh have made the top 10 in a ‘Best of British’ poll. The 10th at Murrayfield came third in the nationwide competition, which also saw the 13th at the Merchants and 16th at Bruntsfield Links finish eighth and 10th respectively. The UK’s Greatest Amateur Hole was a grass-roots campaign organised by BusinessInsuranceFor.com, which provides business insurance services for golf and other sports clubs. “With famous golf holes at major clubs often claiming all the plaudits, we wanted to champion the lesser-known golf clubs around the UK which have some spectacular holes,” said a spokesman. 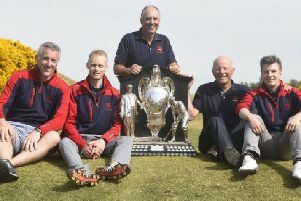 The top 10 was selected by a judging panel comprising of Golf Foundation chief executive Brendon Pyle and Michael Coffey, publisher of The Golf Club Secretary. “It just goes to vindicate our view that ‘Tap o’the World’ is one of the best holes in the game,” said Merchants club administrator Jim Harwood of its placing. The 17th hole at Brickendon Grange Golf Club in Hertford was the winning hole.